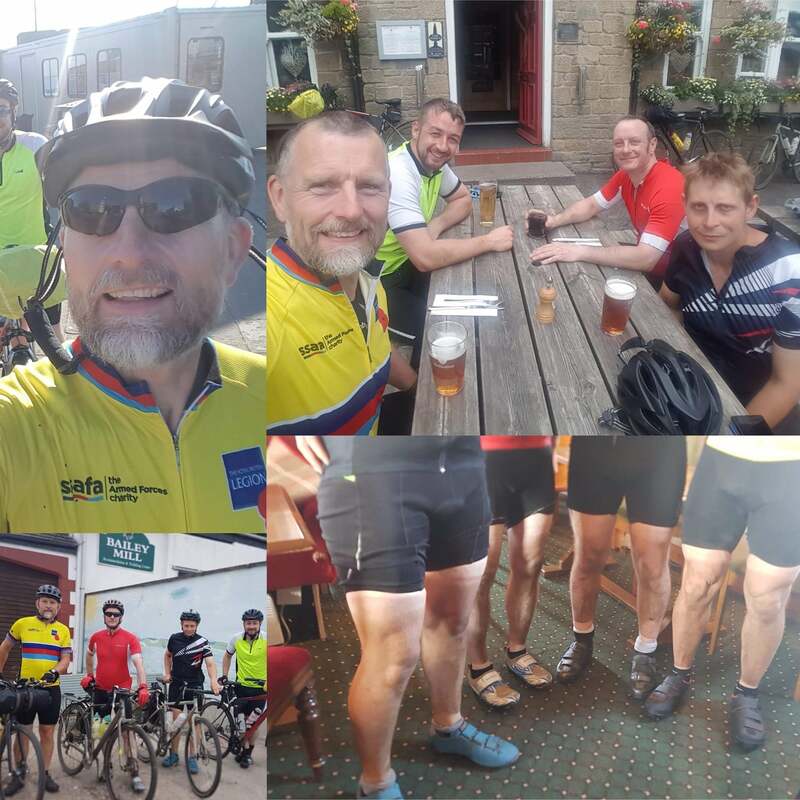 Recently, a group of our members took on a C2C2C off-road ride, Gary Legg has kindly shared his report of the event. As soon as I found out about the Border Reiver Cycle route I wanted to do it. It was recommended to take 5 days but I wanted it to be challenging and I didn’t want to catch the train home so I thought about linking it with the traditional C2C route for a nice big round trip. Hey Presto! Organising any long trip requires commitment for participants, after all most need to book time off work. I settled on 4 days, it was challenging but achievable, meaning over a weekend I’d only need 2 days off work, happy days. 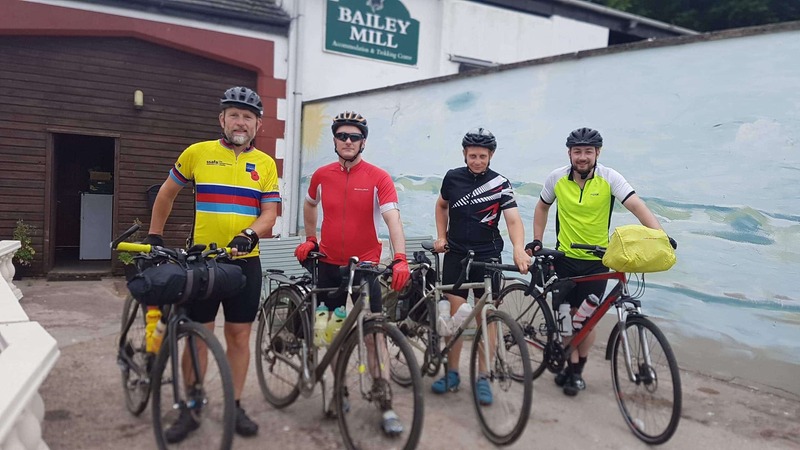 We settled on four in the group which was easy for booking accommodation, they were myself & Craig Usher from NTR plus Rob & Tom from work (Tom’s quite a novice at serious cycling!). We had to set the date of 7-10 July well in advance to make sure we all got the time off work, apologies to those who fancied it but the dates didn’t work for you (We can always do it again). It was already warm & sunny when we met up at the traditional starting point of the clock tower in Tynemouth for a 08:00 start. As I waited for everybody to arrive I watched the traders and council staff setting up for the Mouth of Tyne Festival & was hassled by a swarm of little flying beetles that seemed to be attracted to my yellow cycle top. We got underway, foillowed the riverside and picked up the well-known Waggonway from Royal Keys through Cobalt, Backworth, Weetslade and Ponteland into deepest Northumberland. It was now very warm and by the time we reached Bellingham we were more than ready for our lunch stop, the Cheviot Hotel. Sandwiches and “refreshments” consumed, we topped up our drink bottles from the Co-Op and headed for Kielder and the roughest part of our entire journey. Those who did the Dirty Reiver will remember the rough, dusty tracks south of Kielder, even the long 5 mile downhill wasn’t enjoyable. Finally, and thankfully, we were back on tarmac again and only a short ride to our overnight digs, Bailey Mill, which was right on the route, so no detour required. Our hosts, Pam & Ian were just great, in my opinion it is a great cycle stopover. Day 1 completed. It was hot & dusty, we drank loads but had no mechanicals despite the rough terrain – good result! We were happy to see lots of cloud cover as we set off on another big day and thankful for a slightly cool start. It was a morning of quiet country lanes through southern Northumberland until we reached Carlisle. The city’s cycle routes were successfully negotiated and we finally reached our lunch stop, the Old Crown in Hesket Newmarket. After more fine grub & “refreshments” and drink top-ups we headed off towards Cockermouth in the now hot sun. As we got to Seaton we picked up a lovely off-road track that took us all the way through Workington and to our overnight venue, the Premier Inn. With no cycle storage we were permitted to keep our bikes in our rooms. Once again we had no mechanicals but it was another hot day and Craig had sadly picked up a knee strain so struggled with the steep ascents, he had clearly packed some of Mick Hinder’s Man-Up pills though because he made it despite his discomfort. I expected this to be the toughest day and it was, just. Again we started with decent cloud cover but had to make an early pit-stop at Tesco in Whitehaven for Craig & now Tom who were both nursing knee injuries. Suitably stocked up with all sorts of pills we made our way to the harbour which was the official finishing point of the Border Reiver and the start of the C2C. Those who have done the off-road C2C will know the first section isn’t pretty but once out of Whitehaven we were on a lovely long cycle track that took us into the Lake District National Park. The beautiful views made up for the more undulating terrain. As we hit the ascent to Whinlatter we decided to omit the traditional off-road section as we were behind schedule due to various ailments and there was plenty of hard work still to come. After a pit-stop at the Co-Op in Keswick we followed the pretty old railway bridleway out of town. Our lunch stop this day was the White Horse in Scales right beside the A66. Once again it was a hot & sunny afternoon, we tried to maintain a good pace whilst leaving something in the tank for Hartside. The off-road route to the summit was steep & rough, there was no choice but to walk some of it. Soon we were on the main road to the summit where we saw first-hand the burnt out remains of the café. Now all that was left was the long sweet downhill into Alston. Irritatingly though the slight headwind of the first two days heading west had turned 180° and made the descent a bit harder than it should have been. We were very happy to reach the Youth Hostel and after a quick rest and a much needed shower we headed to the Cumberland Hotel for refreshments and surprisingly good grub, pretty satisfied that tomorrow wouldn’t be so tough. Tom was suffering from a reaction to the pain-killers that got him through the day so had a more low-key evening in the Hostel. What a tough morning! Despite cooler & much cloudier weather it was still a struggle for the first few hours, the constant up, down, up, down was pretty brutal actually. 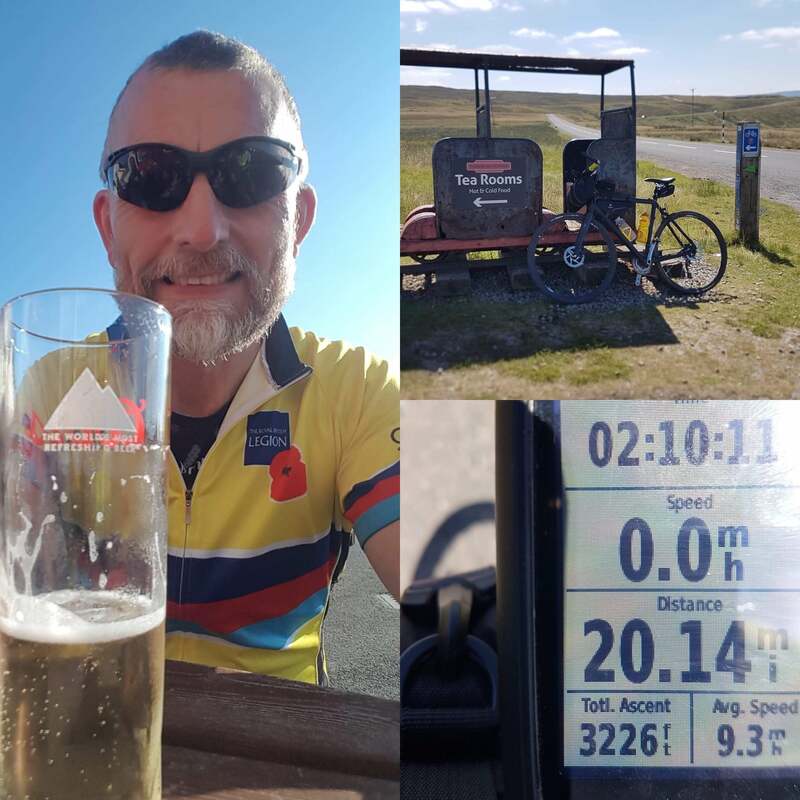 In the first 20 miles we climbed 3226ft, including another long, steep & rough off-road section taking us up to Black Hill summit just out of Nenthead. At Rookhope we spit up. I decided to do the off-road section to Parkhead Café as I hadn’t done it before and was interested to see what it was like, Craig joined me. I wasn’t disappointed, the first half was quite steep & took some effort but the second half was fast & loose with a final stretch of single track that required our full attention. Tom & Rob took the road route which took them up Crawleyside. We enjoyed coffee and cake Parkside Café before hitting the long and predominantly downhill route to the finish. 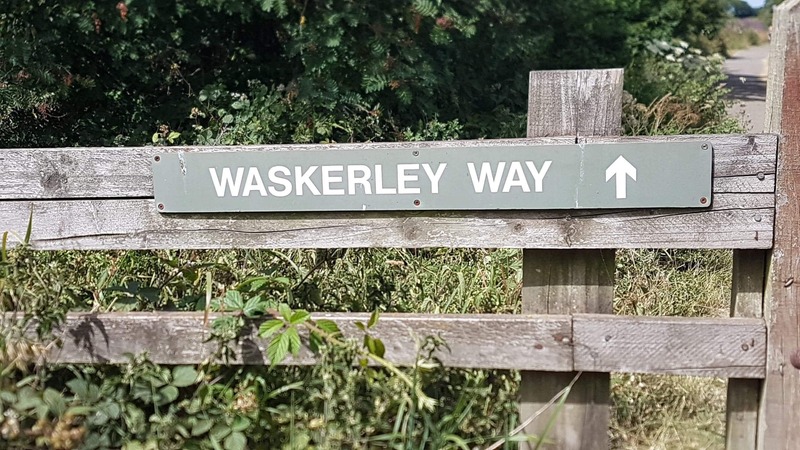 As those who have cycled Waskerley Way and Derwent Way will know this such an enjoyable section that took us all the way to Scotswood. 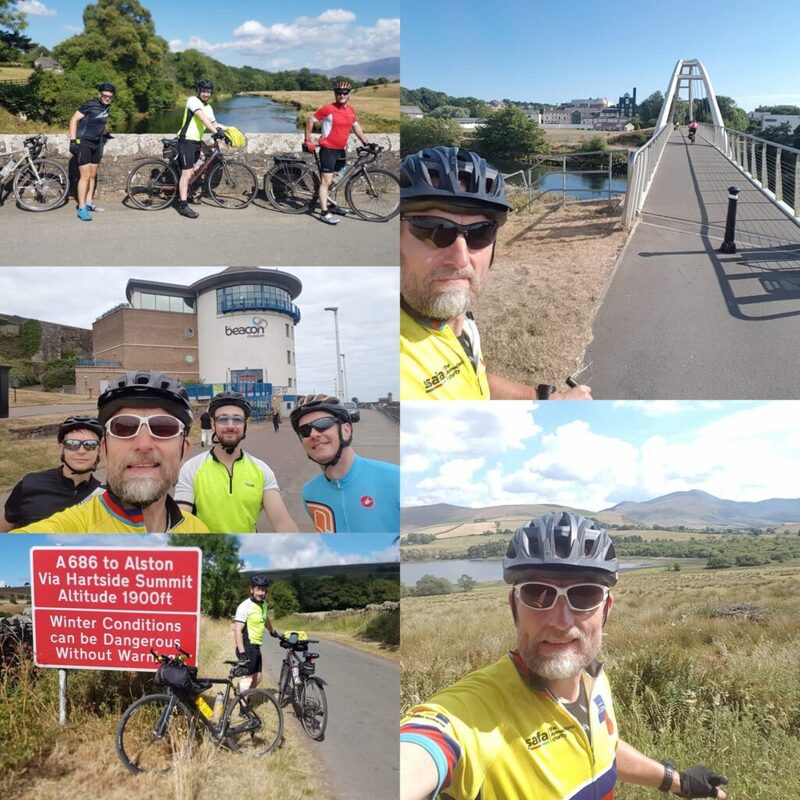 We opted to take the southern shore of the Tyne to the Millennium Bridge and then the Hadrian Cycleway to Howdon, over the A19 and past the Royal Quays again. Finally we were negotiating the short, steep climb to our start point outside Tynemouth Priory less than 4 days earlier. It was congratulations all round and a well-deserved pint from the Gibraltar Rock. We had done it. With a combined mileage of 1260 miles we had no mechanicals and no incidents, what a great result! It was hot most of the time & I haven’t drank so much on the bike but it could have been a lot worse. I would certainly do it again and recommend this to you if you want a challenge slightly different to what you may have done before. You can borrow my maps and even my frontloader bag. There are some magnificent dirtbag routes out there……..get amongst it folks!